I'm always a little bit amused by people who still wonder aloud how and why I find the time to blog. I find time the same way most people find time to watch their favorite television shows, or go to movies (neither of which I do very often at all). And I do it because I've had extraordinarily personal and professional rewards accrue to me as a direct result of the effort I put into blogging--not the least of which is the visiting researcher position I currently hold here at Microsoft. 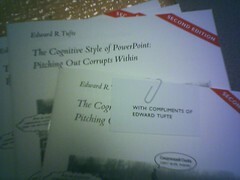 But today's mail brought an unexpected bonus from my blogging, in the form of five copies of the second edition of Edward Tufte's wonderful essay on Powerpoint. It's new enough that it doesn't even seem to be advertised on his site yet. Since the only time I met Dr. Tufte was as a student in one of his workshops more than ten years ago, I can only assume that the "with the compliments of Edward Tufte" card attached to the essays was entirely a result of the posts I've made here about Powerpoint, many of which reference the original essay. A nice bright spot in an otherwise gray day. And a good reminder of the blessings this blog has brought. I just enjoy reading what you have to say -- something I don't do nearly enough, as evidenced by not knowing of your position at MS. Congratulations! This page contains a single entry published on February 2, 2006 3:21 PM. flickr/family serendipity was the previous entry in this blog. fitness update: the tale of the tape is the next entry in this blog.